One of my favorite character meals is Chef Mickey’s in the Contemporary Resort at Walt Disney World. This awesome eatery is a buffet restaurant serving breakfast and dinner with Mickey, Minnie, Goofy, Donald and Pluto. Chef Mickey’s Breakfast Pizza is fast and easy to make. It doesn’t have to be made for breakfast either. I love it as a fun appetizer cut up small for a party. Preheat oven to 375 degrees. Set the pizza crust on a baking sheet. In a medium bowl combine the cheese together. In a small bowl combine the eggs and heavy cream. You can add salt and pepper as desired. Combine the egg mixture in with the cheese mixture just enough so it doesn’t clump together. 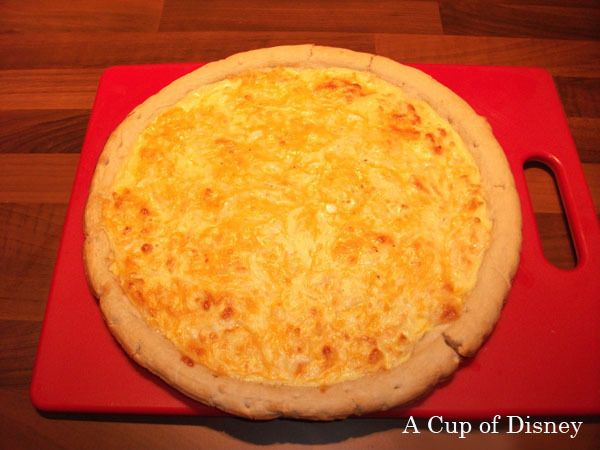 Pour the mixture into the pizza shell and bake in the oven for 10-12 minutes or until the cheese is set.